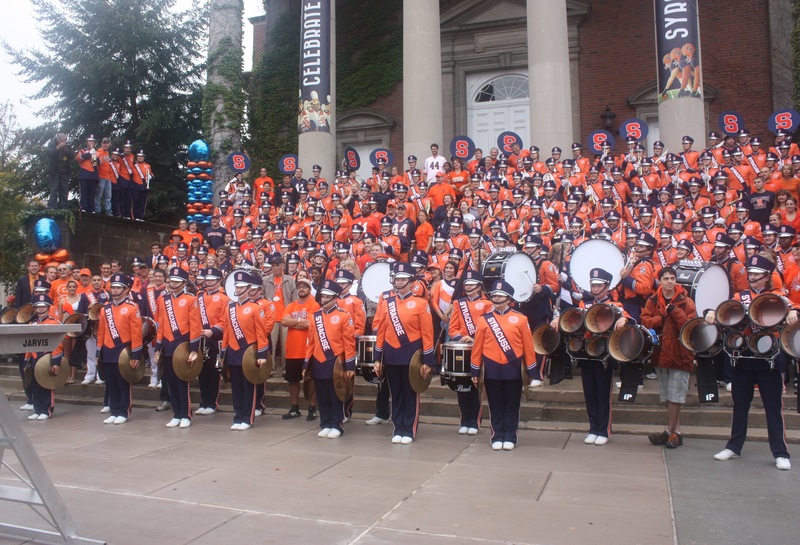 The Syracuse University Marching Band (SUMB) is comprised of approximately 200 members hailing from across the United States and the world. Current band members attend Syracuse University, SUNY College of Environmental Science and Forestry, Le Moyne College, and Onondaga Community College, and study in almost every major imaginable. The “Pride of the Orange” performs its Quad Show on the steps of Hendricks Chapel prior to each home football game. The SUMB was founded in 1904 and evolved into “100 Men and a Girl” in the 1960s. Today, the SUMB is better known as The Pride of the Orange. It is the largest ensemble on the SU campus and the premier collegiate marching program in New York State. The Pride’s main performance and rehearsal venue is the Carrier Dome, where it performs for tens of thousands of fans during home football games. The Pride also performs several parades and exhibitions in Central New York and beyond. In recent years, it has made appearances at international performance venues, NFL halftime shows and award ceremonies in New York City. The Pride has even performed at the Super Bowl.